The AEO RC ADH300 L is a very nice small but powerful outrunner that is narrow enough to fit in small glider noses. It is excellent for electrifying most of the F3-RES models we sell. It can be pushed to about 170W on 3S LiPo batteries or 120W in 2S LiPos. Note the manufacturer label the motor ADS300L-1100 but we are sure the Kv is 1280 RPM/V not 1100 RPM/V as printed. Note the Vitaprop 9x6 blades are too big for this motor on a 3S LiPo battery. Do not use them. We're pleased you would like to review ADH300L Front Mount Brushless Motor. Fantastic fast shipping , and the motor is excellent!!! All the way! Thank you! Bought this for an own design glider that used Hyperflight's Sapphire pod and boom. It arrived in good time, and I was surprised how small and light it was. You never get a feel for these things even though the photos and specs give you the info! Fitted without fuss and with the offset spinner and carbon 11 x 6 blades it really looked the part. I had problems when using a Castle Creations ESC. It would not start consistently and would rattle / stop at anything above idle. This ESC did not offer any timing options, so I swapped for an EnErG and this sorted the problem. 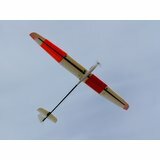 With the 11 x 6 it pulls around 95 - 100W on a 2S LiPo and pulls my little 1.5M span 440 gram glider up at around 70 degrees. Only had three flights so far - hence only 4* at the moment - but so far very happy with performance and quality. I bought one of these to go in a Horesji Geronimo - turns out it was a bit underpowered with a 3S battery and a 9x6 prop but it worked OK. But after about 5 flights (maybe 10 minutes running time) it failed, with one lead now open circuit. I reckon this is unrelated, but while inspecting the motor I also found that the spacing between rotor and stator varies from about 0.6 mm down to about 0.2 mm - a less serious version of David Still's fouling. I have not run them even less mounted them but they have strong magnets, much stronger than normally found in a motor of this size and they appear better made than some. We will see how they go when I have them in a plane. Purchased an E RES Dart, and this motor. Looking forward to flying. The kit is very ingenious but the fun is translating the german building instructions as the english translation available is little better than Google Translate. Having said that, I have found Hyperflight service exceptional, speedy and friendly. Thankyou. I ordered one of these with a RES olution kit after installing it I couldn't get it to work it just jittered the odd time it did go it sounded very rough and on inspection the bell housing doesn't appear to be on straight, I emailed but heard nothing back so ordered a second witch runs fine with no issues so far.The first will be sent back for a refund. Customer now contacted. Refund offered.